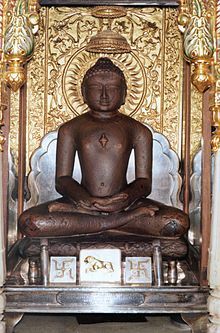 Mahavira (Mahāvīra), an aa kent as Vardhamāna, wis the twenty-fowert an last Jain Tirthankara (teachin god). Mahavira wis born intae a ryal faimily in whit is nou Bihar, Indie, in 599 BC. At the age o 30, he left his hame in pursuit o spiritual awakenin, an abandont warldly things, includin his claes, an becam a monk. For the next twal-an-a-hauf years, Mahavira practiced intense meditation an severe penance, efter which he acame kevalī (omniscient). This page wis last eeditit on 28 September 2018, at 06:34.